Everything we do on a day to day basis relies heavily on our balance, yet it is often neglected and is certainly underrated as a form of exercise training. From early childhood development, right through to our later years of life the ability to maintain a controlled body position whilst performing a certain task is essential to our every-day functioning. This is true for relatively sedentary tasks such as sitting in a chair to walking, reaching for something or more dynamic tasks such as riding a bike. In order to function effectively we require both static and dynamic balance. Coordination is a complex skill and requires good balance alongside strength and agility. Coordination allows for smooth and efficient movement patterns to complete a task. Balance and coordination are some of the main components which are important for success in sport. Sports that require good balance control are skiing, gymnastics, dance and surfing to name a few. In many other sports where there are elements of ball handling skills balance and coordination are vital components to skill development and high performance results- Imagine the additional reach on a tennis court if you have more superior balance to your opponent- it may be the difference between winning and losing a point. Amateur and professional athletes can benefit from sport specific balance and coordination training to improve performance outcomes and reduce injury, which can be achieved with specific Pilates based exercises too. However, it is not only elite sports people that balance and coordination are so important for. It has been well documented that postural dysfunctions, loss of stability and balance control as well as changes in our walking stability are some of the consequences of age-related musculoskeletal changes that occur over our lifespan. Balance impairments and muscular weakness are the highest risk factors for falls. Falls are a huge problem in the over 65 age group. Falls and fractures in people aged 65 and over account for over 4 million hospital bed days each year in England and account for over 18,000 unscheduled admissions and 390,500 bed days each year in Scotland. Falls have a hugely detrimental effect on confidence. After a fall, an older person has a 50% probability of having their mobility seriously impaired. So how can Pilates and Physiotherapy minimise and even halt these changes? 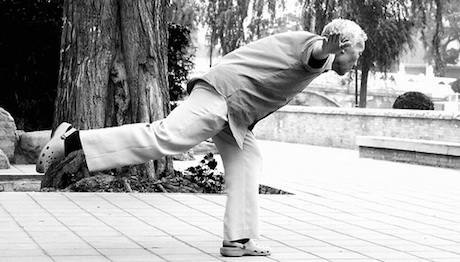 It has been shown that a tailored exercise programmes can reduce falls by as much as 54%, specifically exercises that challenge balance and improve strength through resistance training and exercise in a standing position. Research has shown that individuals may benefit from Pilates-based exercises that are integrated into traditional resistance and balance training programs. Pilates exercise specifically increase trunk muscular strength and it is the improvements with core strength and control which allow for enhanced static and dynamic balance control. Aim to be active every day and follow a gentle exercise regime – the exercises below are perfect. Bridge – you can add equipment to your usual bridge exercise to increase the balance challenge and difficulty. Exhale and roll up into a bridge from your tailbone to your ribs, keep your hips and knees in a straight line and try and extend your leg to increase the difficulty keeping the pelvis in neutral. Repeat 4x on each side. Four point kneel/superman – quadruped positioning is an important load bearing position which helps your base of support and balance control. In four point kneeling, neutral spine, extend the opposite leg to arm away from the body keeping neutral spinal alignment. Adding the theraband will increase the difficulty. Repeat 8x on each side. Engage your core then tip the top half of your body slightly forwards (please use a support if you are unable to balance sufficiently). Bend your front knee and slowly extend one leg back behind you keeping the toes in contact with the floor. Alternate from side to side. Repeat 10x on each side.